Bulbine frutescens is native to desert grasslands in South Africa, this plant grows best in a well-drained soil and is also very tolerant of poor, dry soil. Be careful not to over water, Bulbine does not like wet feet. Bulbine grows best in full sun, has succulent foliage, and produces racemes of star-shaped yellow with orange flowers in the summer months. Orange African Bulbine should be deadheaded to encourage more flowering. Bulbine can withstand a light frost, keep protected in colder climates. Commonly called Bulbinella and Burn jelly plant, the sap in the leaves is used for healing in South Africa. 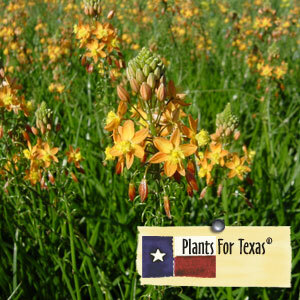 Bulbine frutescens is part of our Plants For Texas® Program, meaning it was Texas Grown, Tested in Texas to perform outstanding for Texas Gardens.